Из серии "Листая старые журналы"
He knows a picture is worth a lot more than a thousand words when you use it right. That’s why he’s investtd in the graphic advantage, the PC-8800 personal computer from NEC. It’s got a separate microprocessor especially for color graphics, and its high-resolution screen makes it easy to “see” business problems clearly. Pete also has to type long reports and track business trends, so he appreciates the low-profile detachable keyboard and the fact that he can use the universal CP/M 80 operating system for a virtually limitless supply of application software. And Pete realizes that great capabilities are only as good as the company behind them. He knows that NEC pioneered in computers and communications. It’s the #1 personal computer maker in Japan. Graphics power is putting Pete ahead with his boss. But how about you? Are you getting the picture? Click to picture for zoom! Из японского журнала Winds JAL, май 1983 г.
NEC PC-8800 personal computer system. (evaluation) David H. Ahl. In the PC-8800, NEC Home Electronics USA has introduced a computer that belies their name. The PC-8800 is a professional business machine and hardly a home computer--although everyone who has seen it covets one for his home. The bundled PC-8800 system comes in four cartons. The first contains the PC-8801A system unit (NEC calls it the "body") and a detachable keyboard. The body is the heart of the system and contains the cpu, memory, interface circuitry, and I/O connectors. It measures 19.5" X 13.5" X 4.2" and makes a very suitable base on which to place the monitor. On the front of the body is a pushbutton off/on switch (hurrah--no elusive rocker switch in the back), a recessed reset switch, a red power-on LED, and a green LED indicating the usee of N88-Basic. More about this later. Under the power switch is a 14-pin keyboard connector. The rear is cluttered with every imaginable type of connector. Three DIN connectors are provided for the color display, monochrome display, and cassette recorder. It is unfortunate that the connector for the color display and cassette recorder are the same; this encourages confusion. D-type connectors are provided for a PC-8031A floppy disk unit, printer, and RS-232 device. A power could jack rounds out the collection of exposed connectors. Four bus expansion slots are covered by metal plates. It is into these slots that controller boards are inserted for the standard disk drives (8881A, 8882, 8831A, and 8832A), speech synthesis units, and other peripherals. Also on the rear are two DIP switches and two jumper switches. These will generally be set once and forgetten. They control such things as which Basic is operative, screen resolution, and communications parameters. They are thoroughly explained in the PC-8801A User's Guide. It is fashionable today for manufacturers to describe their keyboards as "ergonomic," whether they are or not. The one on the 8800 is. Character and number keys are matte finished in light gray while special keys are dark gray. The 92 keys are divided into three sections, a qwerty alphabetic section, numeric keypad, and a row of function keys. The keyboard measures 18.3" X 8.4" X 2.8" and plugs into the system unit by means of a coiled cable. The alphabetic portion of the keyboard is truly standard with shift, caps lock, and tab in the customary place on the left. Unfortunately, there is no LED caps lock indicator, something we have missed since the bygone days of the Teletype 33 and Sol 20. One extra key (underline) at the right end of the bottom row moves the right shift key slightly further to the right than one might expect. The carriage return key is double size, and special symbols are on keys at the right of the alphabetic keyboard. We found it curious that although all of these extra keys produce two symbols (regular and shifted), six kewytops displayed only one symbol. Actually, each key on the keyboard produces up to four characters. These include the usual upper- and lowercase letters, numerals, and symbols marked on the keytops. In addition, if the GRAPH key is depressed, 56 graphics symbols can be produced. If the ALT key is depressed, the regular keys will produce an additional 64 Greek letters and mathematical symbols. In all, the 8800 has 212 built-in characters, all of which are accessible from the keyboard. The numeric keypad at the right side of the unit has 20 keys for the ten numerals, arithmetic operations, comma, period, RETURN, HOME/CLR, and HELP. The HELP key is a great aid when debugging programs. When an error occurs during program execution, pressing HELP displays the statement and image when the error occurred. The four cursor control keys are grouped next to the shift key at the right end of the keyboard. They are in a reasonably logical arrangement, although we prefer the diamond pattern on the portable NEC PC-8201 computer. These keys, along with the INS/DEL (insert/delet) key, are used for on-screen editing of Basic programs as well as for cursor manipulation in other application programs. In the top row of keys are STOP (halts execution of program), COPY (causes the display on the monitor to be printed, assuming a NEC 8023A-C printer is connected), ROLL UP and ROLL DOWN (scrolls the text image on the monitor up or down), and five function keys. Each of the function keys produces two functions, regular and shifted. In Basic, the default definitions are load, run, auto, list, save, goto, key, print, edit, and cont. The keys can be user defined by means of the KEY statement. For example, KEY 1, "Creative" will cause Creative to be printed whenever Key 1 is depressed. The 8801A system unit uses an mpu equivalent to the Z80A running at 4 MHz. In our Basic benchmark program, the 8800 didn't break any speed records, posting times identical to the Apple II and Commodore 64. The basic system is equipped with 64K of user RAM. It can be expanded to 128K with bank switching possible in 32K units. In addition, when N88-Basic is used, 48K of video RAM becomes operational. A 32K ROM memory contains N-Basic and the monitor, while another 40K of ROM contains N88-Basic. The system unit incorporates a NiCad battery to keep the time and date current once they are set. This is a very thoughtful touch, and one that is annoyingly absent on most other computers in this price range. The standard disk drive included with the bundled 8800 system is the PC-8831A with dual double-sided, double-density, 5-1/4" drives. Alternatively, an 8" dual double-sided, double-density drive (PC-8881A) is available. Matching dual expansion drives can be added to both size drive units. For maximum economy, a dual single-sided, double-density, 5-1/4" drive (PC-8031A) is also available. We tested the 8831A unit which is included with the bundled system. When formatted, each side of each disk stores 160K; thus the dual unit stores 640K on line. The drive is reasonably compact, measuring 7.6" X 9.8" X 14.2". The power switch is awkwardly placed at the right rear. A dim, green LED on the front indicates when power is on. The drives should be powered up before turning on the system unit. When power is applied to the unit, the drives do not r otate. The motor goes on only when a read or write operation is initiated by the computer. However, the drive then continues to spin for 2-1/2 minutes, so subsequent disk operations are immediate and do not require a wait while the disk gets up to speed. If the drive is not accessed for 2-1/2 minutes, the motor shuts down. We judge this an excellent way to speed disk response time while saving wear and tear on the drive motor. A red LED indicator on each drive indicates when a read or write operation is taking place; these lights glow at 20% of full intensity when the drives are in the standby state. The User's Guide provides extensive illustrated instructions for using the drives; handling, formatting, backing up, and copying disks; loading N-Disk-Basic and N88-Disk-Basic; maintenance; and troubleshooting. The disk drive is furnished with a system disk that contains both disk Basics, six utility programs, and four demonstration programs. NEC is a major producer of TV sets and display monitors, so it should come as no surprise that the company offers a choice of six monitors with the PC-8800 system. As mentioned earlier, the one bundled with the standard system is the JB-1201, a 12" green phosphor monochrome monitor with resolution of up to 640 X 200 pixels. The monitor also has audio capabilities. Two pairs of RCA jacks are provided for video and audio in and out. The front of the monitor has three controls for brightness, contrast, and volume. Five additional adjustments are provided on the back. The monitor is tilted back at a 5-degree angle and has no provision for adjusting tilt or swivel. Economy 12" and 9" monochrome units are available, as well as an upper-end 14" unit with a resolution of 640 X 400 pixels. Two color monitors are available. The top-of-the-line unit is the JC-1410, a 14" RGB monitor capable of displaying up to 640 X 400 individual pixels. A smaller, less expensive 12" RGB unit has a 640 X 200 pixel capability. For many business applications, the 12" monochrome monitor is perfectly satisfactory. However, the computer is capable of producing spectacular, high-resolution graphics, and it seems a shame to waste this capability with a monochrome monitor. On the other hand, the price differential is $600 or more--enough to make one think twice. We tested the PC-8800 system with both the included monochrome monitor and a Toshiba high resolution RGB monitor attached simultaneously. For text, the monochrome monitor was slightly better, but for anything with color, the RGB unit was far superior. The PC-8800 is capable of producing three text formats: 80 characters by 20 lines, 40 by 20, and 40 by 25. Characters are formed with a 5 X 7 dot matrix; descenders use one additional row of dots. With 20 lines on the screen, interline spacing is two rows of dots; this is reduced to one row with 25 lines on the screen. The descenders on lowercase letters use this spacing line, making readability very difficult in this format. All the application software we examined used the 80 X 20 mode with occasional use of the 40 X 20 mode for titles. In Basic, these modes are set by means of the WIDTH or CONSOLE command. N-Basic has several additional text screen modes. It allows all combinations of 80, 72, 40, or 36 characters by either 20 or 25 lines. The system discriminates between the text screen and graphics screen. Instructions in Basic are provided to alter each screen independently so that a change in one does not affect the other. This is a marvelous feature for writing and debugging graphics programs since the graphics output remains on the screen as the program is listed and changed. The graphics screen is actually composed of three 640 X 200 pixel planes, each one of which can be controlled and set independently. Each plane corresponds to one of the three color guns: red, green, and blue. By combining these colors, eight distinctly different colors can be produced. However, by setting small groups of dots to different color patterns, it is possible to achieve some 60 different colors, hues, and patterns. The NEC PC-6082A data recorder is similar to a standard cassette recorder, but it is especially designed for consistent reading and writing of programs and data on tape. On the other hand, any standard cassette recorder can be used with the PC-8800. Default transfer rate is 1200 baud, but this can be set in Basic to 600 baud for lower quality recorders. The 6082 unit has the usual cassette recorder controls augmented by five program search buttons that help locate specific programs on a tape quickly. 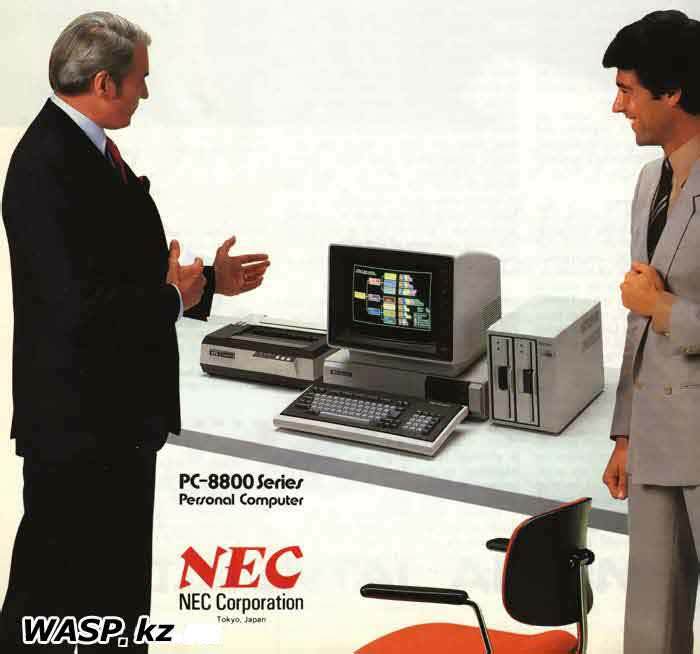 The NEC PC-8800 comes with two powerful versions of Basic, N-Basic and N88-Basic. Both can be used with and without disk drives. The N88-Basic is the primary programming tool of the PC-8800. It is a super-set of the original N-Basic with several extended instructions added to take advantage of the hardware. We did all of our testing with N88-Basic as we believe the majority of PC-8800 users will choose to use that version. N-88 Basic is written by Microsoft and has all the familiar commands, statements, and functions. However, it has many additional capabilities, mostly having to do with graphics and files. As mentioned earlier, three 640 X 200 pixel planes of graphics can be independently produced. The SCREEN command selects the desired plane(s) to be displayed on the screen. The rich variety of available graphics commands are a programmer's delight. Here are some examples. * GET @ saves a graphics pattern from the screen into an array. * PUT @ displays the pattern saved with the GET @ command. * CIRCLE is a generalized statement to draw an ellipse, circle, or arc of any radius, color, or aspect ratio. * COLOR sets the background, foreground, and border color. * COLOR @ sets character colors. * LINE draws a line between user-defined points. * PAINT fills in an area of the screen that has a graphic boundary. * POINT is both a function which returns the last referenced screen coordinates, and a statement which can be used to change those coordinates. * PSET and PRESET turn screen points on and off. * ROLL scrolls the graphic screen up a specified number of pixels. * WINDOW and VIEW are used to specify display areas on the screen which can be scaled and moved to another location. File and device I/O commands are equally extensive and can reference three RS-232 devices, eight floppy disk drives, two cassette tape units, a lightpen, and printer. Three lightpen statements and one function are implemented for use with such a device. Multiple program calls are supported with CHAIN, COMMON, and MERGE. Naturally, data can be passed to and from programs using disk files. These files can be either sequential or random. Although random files are more difficult to use (requiring the use of FIELD, GET, and PUT), the additional effort is rewarded with much faster data recovery in many instances. A pause command for which we have felt a need for years is finally implemented on the PC-8800. WAIT suspends program execution while waiting for specific input. Conversely, INPUT WAIT is used to accept keyboard input for a specified period of time. These are not the ultimate since they work only in conjunction with input, but combined with the real-time clock, they are a step in the right direction. As we have come to expect, N88-Basic has full on-screen editing. The cursor can be moved to any point; a change, insert, or delete entered; and RETURN pressed to enter the change. The INS key turns on insert mode; pressing a cursor key or RETURN turns it off. This is far preferable to having to press the insert key for every character to be inserted. With a 64K machine, N88-Basic can use 56,799 bytes. This is twice the amount of free memory that can be used with Microsoft Basic on many other 64K computers; on such machines, Basic seems artificially limited to addressing 32K or less. N88-Disk-Basic can access 45,410 bytes in a 64K machine. Naturally, if files are specified, buffer space must be allocated which reduces the amount of free memory. As mentioned in the opening paragraph, the documentation with the PC-8800 is nothing short of superb. We have said that the 157-page User's Guide should be the model for the industry. The same can be said for the Basic Reference Manual. Chapter 1 of the Reference Manual is a thorough discussion of the features of Basic including symbols, variable types, expressions, error messages, screen modes, colors, interrupts, and files. Chapter 2 contains a comprehensive description of every Basic command, statement, and function. It has many examples, and, for more complex statements, includes two or three short programs showing the use of them. This is followed by ten appendices, the first five of which contain longer sample programs illustrating some of the more complex statements and programming techniques. Appendix G is devoted to a discussion of the machine language monitor. Although most computers can be programmed in machine code, it is a rare manual that provides any helpful information. This one not only provides the basic information, but also includes many examples of the use of each command. The 262-page CP/M manual is exceptionally comprehensive and, like the Basic manual, includes many examples illustrating the use of each command and utility program. It is the best CP/M manual we have ever seen. Upon powering up the PC-8800 system with the disk drive on and the system disk inserted, the computer goes through a longish 15-second self check and disk load procedure, and finally comes up in Basic. To get into CP/M, the CP/M disk is inserted when the system is powered up. After a shorter 8-second wait, the system comes up with the usual copyright notices and the A> prompt. The word processing program NEC has selected to bundle in with the PC-8800 system is WordStar by MicroPro International. This is a programmer's dream of a word processing system and has many features not found in other packages. On the other hand, it is not at all easy to learn and not at all what we would recommend for the occasional user. Multiplan is the spreadsheet program by Microsoft that some users swear by and others swear at. It has several improvements over the granddaddy of spreadsheets, VisiCalc. However, because of its extended features, many operations and entries require more keystrokes than VisiCalc. On the other hand, on the bottom of the Multiplan screen is a short explanation of the various commands; this aids in learning and using the system. A HELP command, which brings in additional help information from the disk, is also available. One very unhelpful thing is that the CP/M labels for the function keys remain displayed on the bottom row of the screen; they are not implemented under Multiplan and cause an error if pressed. The PC-8800 system includes a powerful terminal program built into the ROM. Since the system includes a standard RS-232 serial interface, with the addition of a cable and modem, the PC-8800 is ready to do duty as a communications terminal. Terminal mode can be entered in two ways. From Basic, the TERM statement allows the selection of communications parameters. Once entered, the computer automatically acts as a terminal. If you expect to use the computer mainly as a terminal, the DIP switches on the back can be set to enter terminal mode automatically upon powering up the system. In addition to the system components described above, eight expansion boards are available for the computer. Perhaps the most interesting board is one containing a 16-bit 8086 microprocessor. Presumably, with this board the 8800 would be able to run IBM PC software as well as many of the emerging 16-bit packages. Details were not available about this board at the time of writing this review. Two memory boards are available, one with 32K and the other with 128K in four banks of 32K each. A serial communication board has two serial ports for different types of synchronous (bisync/SDLC/HDLC) and asynchronous protocols. This board will allow communication with IBM and other mainframes. A voice synthesis and voice recognition board each contain their own cpu, memory, and special chip set for speech synthesis or recognition. 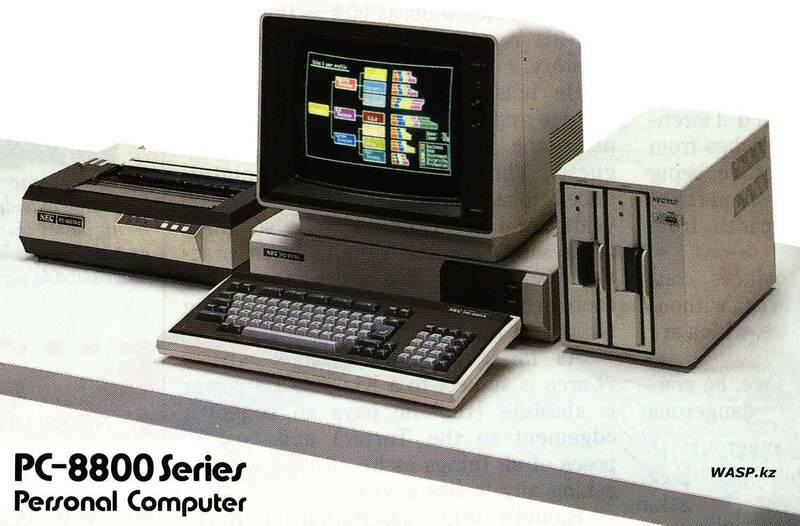 The PC-8800 bundled package includes the computer with 64K, dual 5-1/4" disk drives, monochrome monitor, both Basics, CP/M, WordStar, and Multiplan. The package price is $2497, roughly $1000 less than the individual items purchased separately. The high-resolution RGB color monitors are somewhat pricey; the 14" one costs $998 and the 12" one, $798. The 12" monochrome monitor with the bundled system is $199 by itself; a less expensive unit is available for $149. The PC-6082A data recorder costs $100. The bundled 5-1/4" dual floppy disk drive costs $1099 separately while an 8" dual drive costs $1999. The 16-bit 8086 mpu board costs $550 and a 32K RAM board costs $250. Most of the above items are generally not discounted. One that is is the NEC PC-8023A-C printer. List price is $645, but it is frequently available in the low $500 range. As is probably obvious by now, we are most enthusiastic about the NEC PC-8800 system. It has exceptional color graphics capabilities, an outstanding version of Basic, and a nice complement of included software. The computer has been available in Japan so the bugs are ironed out, and the system should have high reliability. It is an excellent value at the package price of $2497. At the moment, there is not a great deal of packaged software for the PC-8800 system (unless you can read Japanese). Although there is a wealth of software that runs under CP/M, it must be recorded onto NEC disks and configured to use the NEC hardware. This can be done by downloading with the terminal package, but at the moment it must be done by you, the customer, assuming you want any packages beyond the included Basic, WordStar, and Multiplan. We have been assured by NEC that a great deal of additional software will be available before long, and we have no reason to doubt them. As for us, we'll take the system as is; at the price it is a remarkable performer.